When opened on 7 August 1894, Arrochar & Tarbet station was laid out with a crossing loop and an island platform. When the platform was extended southwards, the redundant signal box was relocated slightly further north for use as a waiting room. In 2000, a replica of the signal box was built in the centre of the island platform, after the station building had to be demolished due to subsidence. From the time of its opening in 1894, the West Highland Railway was worked throughout by the electric token system. Arrochar & Tarbet signal box, which had 17 levers, was situated on the island platform. The semaphore signals were removed on 19 January 1986 in preparation for the introduction of Radio Electronic Token Block (RETB). 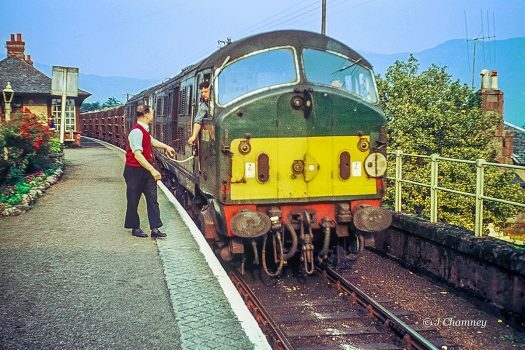 The RETB, which is controlled from a Signalling Centre at Banavie railway station, was commissioned between Helensburgh Upper and Upper Tyndrum on 27 March 1988. After the signal box closed, the lever frame was removed for re-use on the Leadhills and Wanlockhead Railway. Train Protection & Warning System (TPWS) was installed in 2003. Trains approaching Arrochar from the south face a short but steep incline towards the hillside station after crossing over the A83 road. Many a rookie train driver was said to have run into trouble here over the years. The former goods yard is still used by permanent way teams, often for stabling on-track plant machines. As at Ardlui, the small oil store hut is still standing. The yard was still used as a goods yard until very recent years, as it was one of several log-loading points for timber trains. These were operated after privatisation by Transrail and later the freight company EWS, with lorries carrying timber from the nearby forestry plantations in Argyll, which would then be loaded onto wagons. Freight from Fort William to Cadder. Driver and signalman exchanging SLW tablets. The train is conveying empty pressflows from Fort William to Burntisland. 9/9/64. The timber trains mostly ran during the day, though for the last few years EWS instead operated a night-time ‘pick-up’ service, which deposited and picked up wagons at both Arrochar and Crianlarich. This allowed them to be loaded during the day and as there were no booked crossings with other trains during the hours of darkness, longer trains could be run. The night-time train ran Monday-Friday, as the 2055 service from Mossend Yard, near Glasgow, and the 0233 return from Crianlarich (headcodes 6Y38/6D40). Traction on the log trains used to be provided by Class 37 diesels, but latterly they were replaced by the more modern Class 66s. Operations ended in December 2006, though there was a period between 2007-2008 when daytime timber trains returned to both Arrochar and Crianlarich, curiously hauled by Class 57/3s and operated by the short lived company AMEC-Spie railfreight. Timber by rail in the Highlands is now regarded as being impractical and uneconomical, so road transport has taken over. Arrochar and Tarbet station opened to passengers on 7 August 1894 by the West Highland Railway company, along with the rest of the Glasgow-Fort William line. The West Highland Rly would go on to be absorbed by the North British Rly. From the 1840s to the 1880s, railway schemes to penetrate the Western Highlands had generally followed Loch Lomond (there are both ‘eastern shore’ and ‘western shore’ examples). A route via Aberfoyle, cutting to upper Lochlomondside or striking for Crianlarich via Glen Gyle, was also scouted. The Gare Loch-Loch Long-upper Loch Lomond option, eventually chosen for the West Highland Railway, received relatively little attention. However, a local extension of the Helensburgh line, to Garelochhead and Lochlongside, was several times mooted, and the Caledonian Rly company were well aware that Arrochar might become a North British railhead rivalling the Callander & Oban’s Dalmally for the traffic of Loch Fyne. In the aftermath of the Glasgow & North Western promotion, defeated in 1883, Caledonian-North British tensions increased. That the North British might advance incrementally to Crianlarich (with Garelochhead, Arrochar and Ardlui as staging posts), then bid for running powers to Oban, became the Caledonian’s serious anxiety. Landlord support, or at worst, forebearance was essential to the West Highland promotion. The Colquhouns of Luss wanted ‘residential’ development between Helensburgh and Arrochar. On the basis of Charles Foreman’s survey north from Craigendoran, they were ready to make common cause with the proprietors of Lochaber. The Loch Fyne Light Railway, authorised in 1897 but never built, would have made junction with the West Highland at Arrochar & Tarbet. Having described a horseshoe in and out of Glen Loin, behind Arrochar village, the line would have run below the ‘Cobbler’ and over the ‘Rest-and-be-thankful’, terminating at St Catherine’s opposite Inveraray. Additionally, the West Highland promoters claimed that Loch Long, with Loch Goil, would offer worthwhile fish traffic. But consignments from Arrochar & Tarbet, carted from Arrochar pier, were always modest. 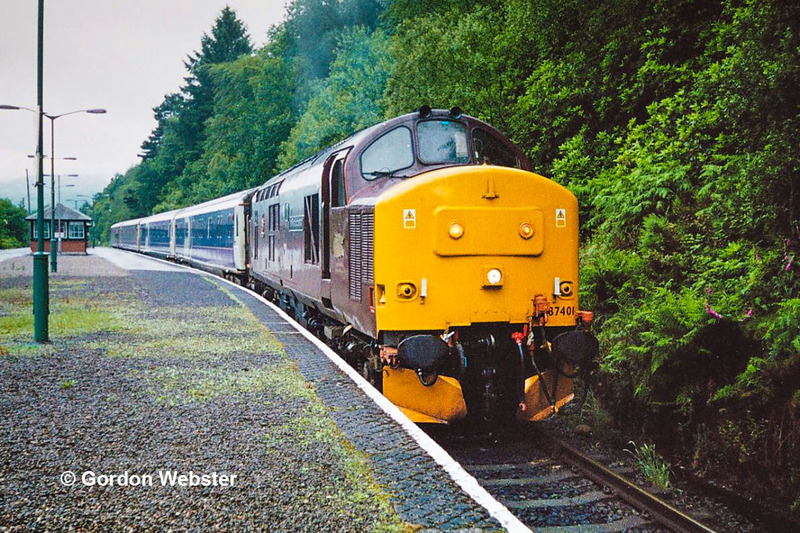 Until the big changes of the Beeching cuts in the 1960s, there was a local train service which covered the southernmost section of the West Highland Line, running between Arrochar and Craigendoran. It ran under push-pull operation, usually an ex-North British C15 4-4-2 tank engine hauling two non-corridor coaches. ‘Push-pull’ meant it could run in the opposite direction propelled by the locomotive without it having to run round the train. This practice continued until the 1960s when BR diesel railbuses and DMUs took it over, but not for long. Craigendoran closed as a West Highland station in 1964 and the service was axed. Running a shuttle service like this had not been the original intention in the early days of the railway. The North British planned an outer-suburban Glasgow-Garelochead service, co-ordinating with West Highland trains to/from Fort William; but this was short-lived. Ironically, a Glasgow-Garelochhead service did come to fruition much, much later. In October 1996, the newly-privatised ScotRail introduced a southbound Monday-Friday early-morning service for commuters and in 2005 it was extended to start at Arrochar. It has remained in the timetable since but now starts back at Oban. Arrochar & Tarbet has been a well-used crossing point for trains on the single-track line through the decades. Its compact nature is typical of many West Highland stations; of particular note is the sharp radius of the points at each end. This layout could prove problematic when lengthy trains had to pass and during the days of steam many services had extra coaches added, with through carriages from Edinburgh or London on the sleeper service. Summer loadings were particularly heavy, with double-headed locomotives to boot, continuing into the diesel era. This saw Oban trains start to use the line also, and these frequently passed the Fort William services at Arrochar. An interesting feature of Arrochar signal box, before it closed, was safety equipment used to warn of any earth tremors along the Highland Boundary Fault, which the West Highland Line crosses over just north of Glen Douglas. A bell was fitted as a warning system and there was also one inside Glen Douglas signal box. Neither are believed to have ever been activated. 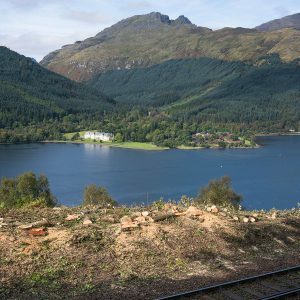 Many traditional circular tours (Clyde Coast, Loch Lomond and Trossachs) by train and steamer included a rail journey to/from Arrochar & Tarbet. A few examples were still being offered during the 1960s. 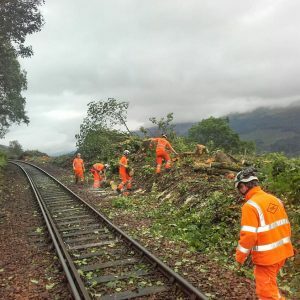 Contractor's staff clearing trees from above Loch Long in early August 2016, to reveal views of the loch and the Arrochar Mountains south of Arrochar. This one of the locations identified following detailed surveys by the Society with the assistance of Network Rail staff. Cleared view to Ardgarten and Ben Arthur (The Cobbler).